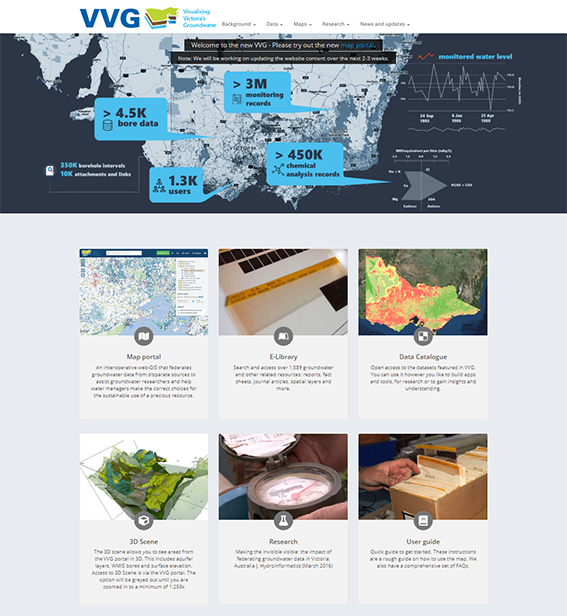 Visualising Victoria’s Groundwater (VVG) is an innovative technology offering a real-time, centralised site for Victoria’s ground water information, a resource normally invisible to the public. VVG consolidates data from over 400,000 bores from four authoritative sources together with Victorian aquifer information with features that include spatial visualisations, hydrogeological models and historical records and maps. In 2018, an updated and modernised VVG portal was launched offering extensive new functionality and content. 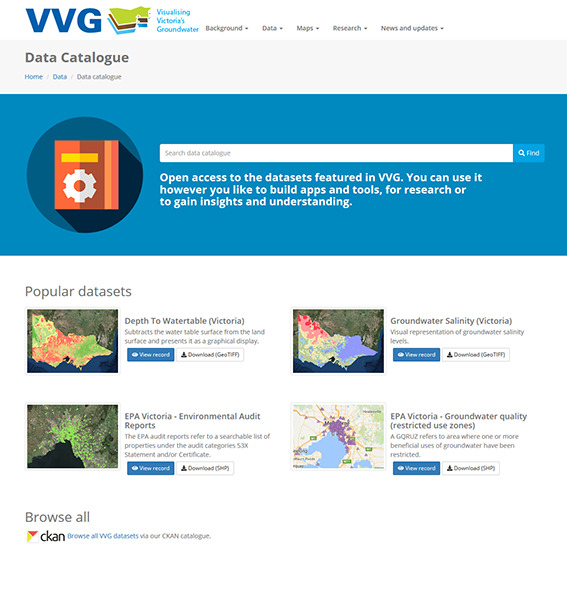 VVG was launched in July 2012 offering an intraoperative spatial information portal that federates groundwater data from disparate sources. 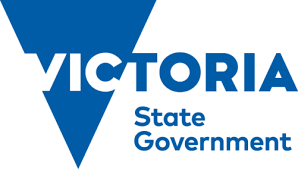 Until the project’s commencement, information about Victoria’s groundwater data was difficult to locate and was stored in various databases with only a fraction of the information available online. 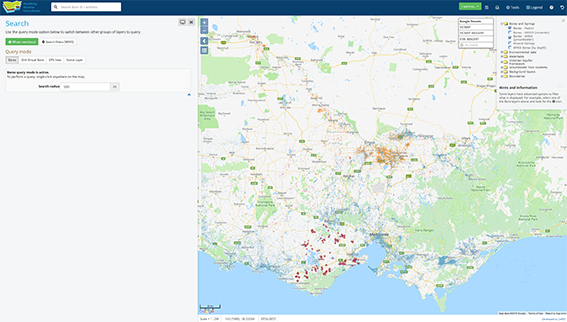 Using the interoperable technologies and high speed broadband CeRDI was able to successfully capture, aggregate and spatially depict Victoria's groundwater systems within one comprehensive and publically accessible web portal. This ease of access and exploration of Victoria’s groundwater data allows VVG to be readily adopted by water users, resource managers, landowners and conservation groups to inform their decisions about managing consumptive water use and environmental water flows. VVG won wide acclaim from the technology and science industries culminating in several awards, and publications of note, for the industry. The success of the VVG project has also led to collaboration with Open Geospatial Consortium on the development and trialling of international standards in the ground water mark-up language GWML2. During 2018 an updated and modernised Visualising Victoria’s Groundwater (VVG) portal was developed. It was officially launched in April at a meeting of the International Association of Hydrogeologists (Victorian Chapter) by CeRDI’s Associate Professor Peter Dahlhaus. Principal research fellow Associate Professor Peter Dahlhaus and the CeRDI team have worked extensively on developing the new portal and expanding its usability and functionality. Significant upgrades include an online library of resources / e Library (pictured below), a spatial map interface (pictured above), and a data download catalogue (pictured below). The new Beta VVG portal was created as an ongoing experiment in data democracy. It helps provide the evidential basis for community debates around the groundwater impacts of energy resource developments, urbanisation and changing climates. The portal has been increasingly used by the groundwater industry professionals, government agencies, researchers and the general public. CeRDI was a participant in the interoperability experiment as part of the development of the Groundwater Mark-up Language version 2 (GroundWaterML2) initiated by the Open Geospatial Consortium (OGC). As a testbed for the official OGC interoperability experiment, CeRDI worked closely with other participants to ensure the standard was implementation-ready. 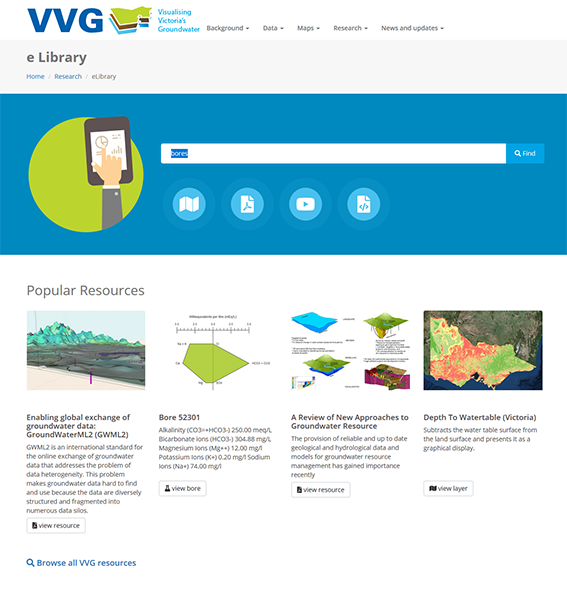 The web-based 3D Visualisation component of the VVG portal was developed in collaboration with the Groundwater Visualisation team at QUT. The system was able to deliver the 3D rendering power of the GVS desktop system via a web browser for the first time. Newly available browser technology (HTML5 web-sockets) was used to allow the user to interact with the remote 3D server which was able to stream the 3D scene in real-time. 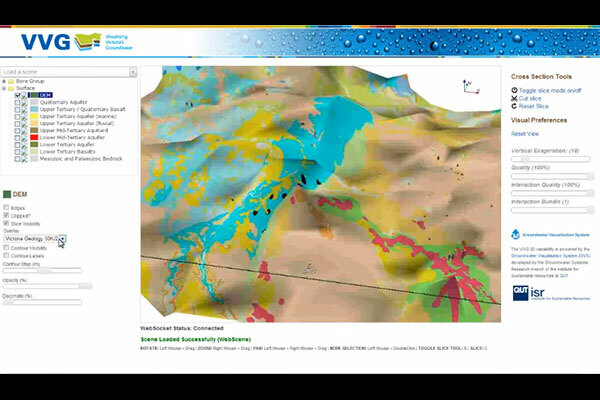 Spatial data infrastructure (SDI) has been developed and deployed to federate groundwater data from disparate database sources into a single web portal thereby making data more easily discoverable. VVG has changed both the way consultants in the groundwater industry work, and how the sector provisions data to assist both the private and public sectors. The Visualising Victoria’s Groundwater (VVG) portal is setting new standards in user access and functionality. Justifiably, it has won numerous industry best practice awards. Its rapidly growing use is a result of its ability to federate a diverse range of data, its ease of accessibility and the quality of the data. The frequency of use and repeat visitation rates testify to its value and it is a tribute to the CeRDI team’s efforts. Finalist in the 2013 Australian and New Zealand Internet Awards (ANZIAs; Innovation category). Contribution of geological bore database and seamless geology, expertise and advice, test site for data transfers. Co-funder, domain expertise and knowledge, development of research tools, end-use testing. Contribution of 3D models of the groundwater systems of southern Victoria, data provision, governance, service user. Expertise and knowledge of research hardware and software infrastructure, technical advice, and development or research tools. Expertise and knowledge, especially in the Spatial Information Services Stack and OGC standards. Contribution of knowledge of the groundwater systems of northern Victoria, data provision, governance, service user. 3D groundwater system modelling and visualisation experts, domain and data expertise. 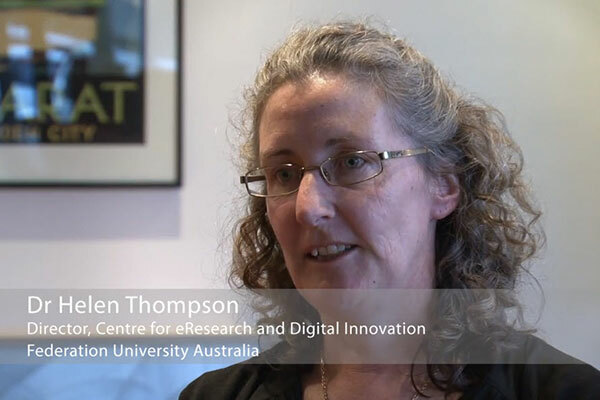 Expert knowledge of existing eResearch tools, OGC standards, and contributor to developments. Trial consumers of end-use data and models, advisors on potential uses.